With spring right around the corner, all of us at petswelcome start thinking about going on a pet friendly road trip. Where you go is up to you. 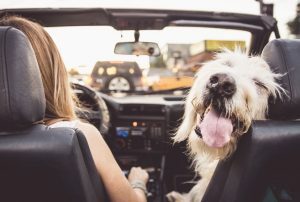 But, as far as the mechanics of planning and driving, there are a few basic rules you should follow that will make your pet friendly road trip safe, fun and rewarding. First, we recommend feeding your pets very lightly a couple of hours before you leave, along with giving them a small amount of water. This ensures your pet is comfortable and not dehydrated or suffering from a lack of nutrition while minimizing the chance they will get sick from the anxiety of traveling. Periodic water stops and an occasional non-greasy or meat-free snack should keep them satisfied for the duration of the journey. In the event of a very long drive, another light meal may be considered. If you find that no matter what you do, your pet is extremely agitated in the car, then check with your vet to see if they recommend administering a light sedative, but only do so with your vet’s approval. Another very important rule is to keep your pet secure within your vehicle. For medium to large dogs, this involves using a harness. Check out our article on the Best Harnesses for Traveling with Your Dog. For smaller pets, a carrier secured by a seatbelt ensures that your cat or Jack Russell won’t get banged around the car—or within the carrier itself—in the case of sudden stops or turns. If not safely secured they can, in very short order, be turned into flying projectiles, causing serious injury both to your pet and other passenger in the vehicle. Also, while it might seem fun to allow your pets to hang their heads out the window, resist the temptation. Animals can get seriously harmed by being subjected to pebbles, insects and other airborne objects. Finally, planning is everything. If you’re going for a long trip, know where pet-friendly hotels are along your route. We recommend using our Pet Friendly Road Trip Planner, which allows you to enter a departure and destination city as well as any stopovers you are considering along the way. You can also have it show you the hotels at given mileage distances, like every 200 or 300 miles. The planner will give you driving directions as well as a list of all the pet friendly lodgings on the route along with their pet policies. You can then select and book the hotels that are best for you. You can even drag the route to a different road if you prefer a different way of getting to your destination. Best of all, you can share your route and/or save it to use while you’re on the road. Then all your selected pet friendly hotels and directions will be available for easy reference at the time you need them most. And, if you want to make any changes to your itinerary, you can do that, too. Having the ability to be flexible when traveling with a pet is critical to a successful trip. Practicality, convenience and ease of use are the hallmarks of our Pet Friendly Road Trip Planner, offering peace of mind to what can often be a stressful undertaking. Not to honk our horn too loudly, but we think it is an invaluable tool for making your next road trip with your pet an enjoyable and hassle-free experience.